On The Move . . .
From Rexburg, Idaho (where we lived from 1999-2001, 2003-2008). 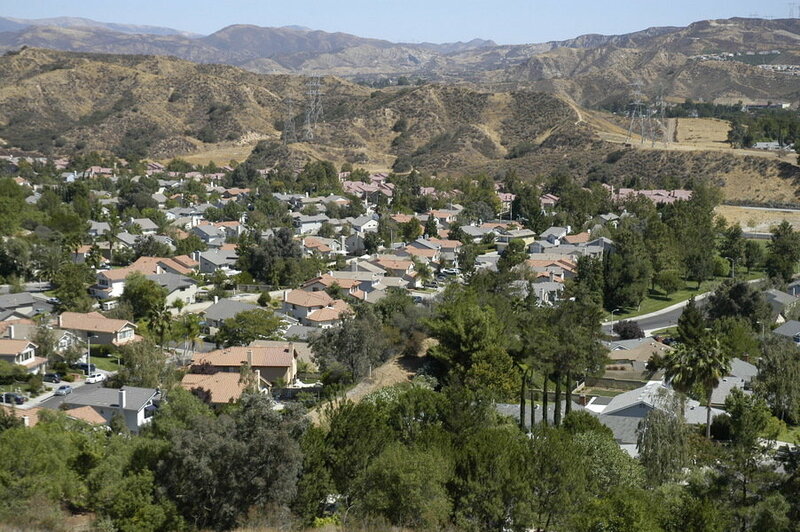 . .
To Santa Clarita, California (2008-2010). . .
Back to Fremont where we were born and raised!! In January 2008 Ryan was recruited to work at the Southern California division of a nation-wide commercial construction company. He had just graduated in Construction Management, and I was in the middle of teaching my first year of first grade, and we were living in Idaho. We made the decision that he should take the job and move, and I would join him in June when the school year was over. It was an amazing opportunity for a great job that we couldn't pass up. I stayed at our house with all of our things, and in June 2008 Ryan came out for a week, we packed up (and packed, and packed, and packed) and moved to Santa Clarita, CA. It was exciting and new at first, and within 2 months of moving I found a job teaching kindergarten at a small, private preschool. Then after a while we started to realize that Southern California wasn't quite for us. We experienced quite a few disappointments while living here, and I realized it's not really all that it's cracked up to be living in sunny California. Being from the Bay Area, we found ourselves visiting it there quite a bit and actually missing it. I always felt like we were in the "wrong" part of California. I guess it's my NorCal pride!! It hasn't been horrible living here, we've actually done a lot of fun things, it just isn't a place we really wanted to spend the rest of our lives in. But, Ryan had a great job and we knew that over time things would smooth out and we'd get accustomed to life in SoCal. Then about 2 weeks before Christmas 2009, Ryan was unexpectedly laid off from his job due to the economy. It came as a total shock and we had no idea what to do. My job was solid so I just kept working while we tried to figure out what to do. Everything was up in the air and it was driving me crazy!! Should he try to find another job here in SoCal even though we'd rather be somewhere else? Should we go back to Idaho? Should we try to go back to the Bay Area where we haven't lived for 7 years??? I am very much a planner and do not do well when life throws unexpected turns, so my stress level was pretty high, but I tried to stay calm while we rationalized and weighed our options. Ryan tried and tried to look for a job here but came up with nothing. There's nothing happening in Idaho so for right now we dismissed that option too. We were getting desperate, he needed to start working asap. Thankfully, he was able to find a job, but in the Bay Area. And thankfully, we have caring, supportive family members who have opened their homes to us while we try to smooth out this major bump in the road. So Ryan starts work next week and is moving to Fremont this weekend. Our lease is up Feb. 11th so I'm staying at my job until Feb. 12th, just to get through our lease. I figure I might as well keep working while I have the opportunity to do so. Then I'll try to find a job once we move to the Bay Area. We have no idea how temporary or permanent this is going to be, but it's something for now so we decided we need to go with it. We may make our way back to Idaho, but for now it's back to the Bay. I guess there's no place like home!! I have to admit, I did a lot of complaining during our time in Southern California, so it makes me wonder if God heard my complaints and granted us a way out, even though it's not the easiest!! It's extremely unfortunate that Ryan was laid off because he had so much going for him and could have done great things for the company he was working for. He wasn't the only one let go, though, so he just fell victim to this recession that we're going through. We might be nomads for a while, but as long as we can pay the bills and be together, we'll be able to get through it!